She suspended her campaign on January 4, 2012, after coming in sixth at the 2012 Iowa caucus elections. Bachmann speaking at the Ames Straw Poll in August 2011. A controversial Newsweek cover with Bachmann, entitled "the Queen of Rage"
Bachmann performed well in mid-2011 polling of the Republican presidential primary. By late July 2011, a PPP poll of national Republican primary voters found her in the lead with 21%; her nearest competitor, Mitt Romney, received 20% in the poll. On August 13, 2011, she won the Iowa Ames Straw Poll with 28.6% of the vote, one point more than her nearest competitor, Ron Paul. At a campaign stop in South Carolina on August 16, 2011, Bachmann wished (the late) Elvis Presley a "Happy Birthday",  apparently believing that it was the anniversary of his birth. Instead, it was the anniversary of his death; Elvis Presley was born on January 8, 1935, but he died on August 16, 1977. ^ a b Staff (June 13, 2011). "Rep. Michele Bachmann Makes Presidential Run Official". CNN. Retrieved July 15, 2011. ^ Kilgore, Ed (March 17, 2011). 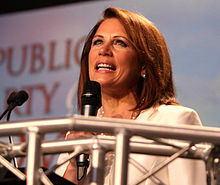 "Springtime for Bachmann – Why She's a Serious Contender for 2012", The New Republic. Retrieved July 15, 2011. ^ Diaz, Kevin; Herb, Jeremy (January 5, 2011). "Bachmann Considering White House Bid, Aides Say". Star Tribune. Retrieved July 15, 2011. ^ Parkinson, John R. (January 5, 2011). "Exclusive: President Michele Bachmann?". ABC News. Retrieved January 5, 2011. ^ a b Stewart, Rebecca (January 22, 2011). "Bachmann 'Encouraged' in Iowa". CNN. ^ Pindell, James (January 22, 2011). "Results: WMUR, ABC News, NH GOP 2012 Straw Poll". Archived from the original on August 25, 2012. ^ Killough, Ashley (September 5, 2011). "Rollins steps down in Bachmann campaign shake-up". Political Ticker. CNN. ^ Haberman, Maggie (September 5, 2011). "Michele Bachmann deputy campaign manager to depart". Politico. ^ Gabriel, Trip (October 21, 2011). "Bachmann’s N.H. Campaign Manager Confirms He Is Leaving". The New York Times. ^ "Bachmann"s New Hampshire Campaign Departs" (PDF) (Press release). Manchester, NH: Team NH – Bachmann for President. October 23, 2011. ^ "Bachmann Launches Presidential Campaign, Says Nation 'Cannot Afford' Second Obama Term". Fox News Channel. June 27, 2011. ^ Kucinich, Jackie (June 27, 2011). "Debate Showing Elevates Bachmann to Higher Tier". USA Today. ^ Transcript (June 26, 2011). "Rep. Michele Bachmann Talks Earmarks, Obamacare and Gay Marriage; Sen. Kyl on Debt Talks". Fox News Sunday. Retrieved July 15, 2011. ^ Malcolm, Andrew (June 27, 2011). "Michele Bachmann Refuses To Accept Chris Wallace's Apology". Los Angeles Times. Retrieved July 15, 2011. ^ Bakst, Brian (July 19, 2011). "Bachmann: Migraines won't impede White House goals". Long Island Press. Associated Press. Archived from the original on September 7, 2012. Retrieved August 31, 2011. ^ Hunt, Kasie; Ball, Molly (July 20, 2011). "Michele Bachmann faces more migraine questions". Politico. Retrieved August 31, 2011. ^ Blake, Aaron (July 19, 2011). "Afternoon Fix: Bachmann says headaches not an issue". The Washington Post. Retrieved August 31, 2011. ^ Krueger, Alyson (July 19, 2011). "Bachmann Guard Accosts Reporter After Migraine Questions". Time. Retrieved August 31, 2011. ^ Sargent, Greg (July 19, 2011). "Michele Bachmann's handlers get rough with reporter". The Washington Post. Retrieved August 31, 2011. ^ "Bachmann continues to surge". Public Policy Polling. July 19, 2011. Retrieved August 31, 2011. ^ Haberman, Maggie (August 9, 2011). "Michele Bachmann's Newsweek outtakes". Politico. Retrieved August 31, 2011. ^ "Newsweek's Michele Bachmann Cover Raises Eyebrows". Huffington Post. August 8, 2011. Retrieved August 31, 2011. ^ Flock, Elizabeth (August 8, 2011). "Newsweek Michele Bachmann cover 'sexist' and in bad form?". The Washington Post. Retrieved August 31, 2011. ^ "Bachmann Newsweek Cover Goes For Insult But Gets Criticism in Return". Fox News Channel. August 9, 2011. Retrieved August 31, 2011. ^ Cassidy, Suzanne (September 18, 2011). "Playing Doctor: Candidate Bachmann's Comments On A Cancer Vaccine For Girls Upset Physicians". Sunday News. Lancaster, PA. p. 1. ^ Wyler, Grace (March 24, 2011). "The Nine Craziest Things 2012 Presidential Candidate Michele Bachmann Has Ever Said". Business Insider. ^ Grier, Peter (June 28, 2011), "Will Michele Bachmann's Gaffes Hurt Her Presidential Candidacy?". The Christian Science Monitor. ^ Malcolm, Andrew (June 28, 2011). "John Wayne to John Adams: Michele Bachmann Stands by Her (Mis)statements". Blog of the Los Angeles Times. ^ Kim, Mallie Jane (June 29, 2011), "Will Michele Bachmann's Gaffes End Her Presidential Chances?". U.S. News & World Report. ^ "Bachmann Mangles Revolutionary History in N.H". RealClearPolitics. March 12, 2011. Retrieved August 31, 2011. ^ Adair, Bill (April 30, 2009). "Michele Bachmann wrong that swine flu broke out under Carter". PolitiFact. Retrieved August 31, 2011. ^ Walsh, Joan (January 25, 2011). "The Skewering of Sal Russo". Salon. ^ Phillips-Sandy, Mary (January 25, 2011). "Michele Bachmann Schooled by Anderson Cooper on Eve of Her State of the Union Rebuttal [Video]". AOL News. Archived from the original on June 20, 2011. ^ Capehart, Jonathan (January 24, 2011). "Michele Bachmann's 'Absolutely Amazing' View of History". AOL News. ^ Dinan, Stephen (June 27, 2011). "The Wrong John Wayne". The Washington Times. Retrieved July 15, 2011. ^ Lane, Sam (June 27, 2011). "Bachmann Campaign Corrects John Wayne Blunder". The Minnesota Independent. Retrieved June 27, 2011. ^ Bell, Melissa (June 28, 2011), "John Wayne Gacy Gaffe Delights Michele Bachmann Opponents". The Washington Post. ^ Condon, Stephanie (June 28, 2011). "Bachmann on John Wayne Gacy Gaffe: I'm Not Perfect". CBS News. ^ Adair, Bill (June 27, 2011). "Schieffer Asks Bachmann About Her Record for Accuracy". PolitiFact. ^ Linkins, Jason (August 11, 2011). "Michele Bachmann Asked If She Is A 'Submissive Wife' At Iowa GOP Debate". Huffington Post. Retrieved August 14, 2011. ^ a b Bennetts, Leslie (August 12, 2011). "Michele Bachmann Deflects 'Submissive' Question at GOP Debate". The Daily Beast. Retrieved August 14, 2011. ^ Bolduc, Brian (August 14, 2011). "Gregory Grills Bachmann on 'Meet the Press'". National Review. Retrieved August 14, 2011. ^ Samuel, Stephanie (August 13, 2011). "Bachmann 'Submissive' Question Ignites Debate Over Marriage, Sexism, Christian News". The Christian Post. Retrieved August 14, 2011. ^ "Michele Bachmann's Elvis Birthday Message Comes On Anniversary Of 'The King's' Death (VIDEO)". Huffington Post. August 16, 2011. Retrieved May 30, 2013. ^ Goldman, Russell (January 4, 2012). "Michele Bachmann Drops Out of Presidential Race". ABC News. ^ Henry, Devin (December 1, 2011). "Bachmann picks up congressional endorsement, adds tea party staff". minnpost.com. Retrieved December 5, 2011. ^ Noble, Jason (December 14, 2011). "Updated: Iowa state Sen. Merlin Bartz endorses Michele Bachmann". Des Moines Register. Retrieved December 15, 2011. ^ Waddington, Lynda (July 1, 2011). "Bachmann gets nod from fourth Iowa Senator". The Iowa Independent. Archived from the original on August 9, 2011. Retrieved August 14, 2011. ^ "Iowa State Senator Mark Chelgren Endorses Bachmann". The Iowa Republican. July 1, 2011. Retrieved August 14, 2011. ^ a b Waddington, Lynda (June 28, 2011). "Sorenson, Zaun make Bachmann support official". The Iowa Independent. Archived from the original on September 5, 2011. Retrieved August 14, 2011. ^ a b Jacobs, Jennifer (August 9, 2011). "GOP lawmakers De Boef and Brandenburg endorse Bachmann for president". The Des Moines Register. Retrieved August 14, 2011. ^ Beam, Adam. December 6, 2011 The State " Bachmann courts Cain’s S.C. supporters Archived January 12, 2012, at the Wayback Machine" . Retrieved December 10, 2011. ^ Jacobs, Jennifer (December 4, 2011). "Conservative activist Phyllis Schlafly endorses Michele Bachmann". The Des Moines Register. Retrieved December 6, 2011. ^ "Endorsements Draw Attention, Not Votes". FrumForum. June 26, 2011. Retrieved August 31, 2011. ^ "Bachmann Announces Largest SC Team". December 27, 2011. Archived from the original on April 11, 2013. Retrieved February 8, 2013. ^ Moody, Chris (October 19, 2011). "Wayne Newton cuddles with Michele Bachmann on Fox News, kisses her". Yahoo! News. Retrieved December 5, 2011. ^ "Campaign 2012: Hubbard Broadcasting Chief Endorses Michele Bachmann's Presidential Campaign (Report)". The Hollywood Reporter. August 17, 2011. Retrieved August 31, 2011.